This is a blog about the ways found by my thoughts. I am not a "cook", I am not a "crafter", I am not a "gardener", and I am not a "baker". I'm just trying to figure out what it means for me to be human... and occasionally that involves the use of an oven or some felt. Once again, it has been far too long since I posted. Sorry about that! I have a lot of recipes I want to share, especially since I've been cooking a lot of new and different things after we switched to being vegetarian. But of course, life got in the way. Specifically, school got in the way. For the past two quarters-- so, about 5 months-- I've been taking online classes to finish up some prereqs for my master's in teaching. The classes will enable me to pursue dual endorsements in Secondary English/ Language Arts (which I was already qualified for) and Middle School Humanities (which is what I needed some extra classes for). Thankfully, summer quarter ended last Thursday. Now I have a month or so to regroup and do fun things before I start my program in the fall. Becoming a teacher scares me to death. It always has, actually-- I am 99% sure that is the real reason I quit the teaching program in undergrad (though I legitimately did get interested in other things). I'm afraid that developing lesson plans will be too overwhelming. I'm afraid the kids won't like me-- or worse, that they won't respect me. I'm afraid parents and administrators will hate me. I'm afraid my kids won't learn anything. I'm afraid of being a terrible teacher. And this time around, I'm also afraid of failing at yet another thing. Everyone was very supportive when I dropped my first grad program, but I'm not sure how great the reaction would be if I did it again. But, I've seen time and time again that the scariest things are the ones most doing. Quinoa, on the other hand, is not at all scary (even if Bob thinks that it looks like bugs). And Quinoa Salad with Black Beans and Mango is definitely not scary. Quinoa looks a bit like couscous, and has a similar texture to it. It's fluffy, with a bland flavor that goes well with pretty much anything. It is also a complete protein, which is great for us non meat-eaters. It's actually a seed rather than a grain. Quinoa is easy to prepare. We just put it in some water with some vegetable broth powder (use straight up veg broth if you have it, we just use the powder because it is cheaper) and bring it to a boil for 15 minutes, then let it rest off the heat for another 5. Presto! If we eat it by itself, I usually add some garlic or cajun seasoning, but for salads like this I leave it pretty plain. This recipe is from the cookbook "Veganomicon" by Isa Chandra Moskowitz and Terry Hope Romero. It by far one of my favorite cookbooks, and you should go out and get it right now. You are done! Serve chilled or at room temperature. the olympics make me want to be canadian. Like everyone else, I've been watching a lot of the Olympics. While watching people win gold medals despite injuries, and hearing about the 8 million jobs each athlete holds down to fund their training, and listening to the story of the athlete who lived in a tent so she could afford to train, and seeing the looks of determination on each person's face, it amazes me the lengths that these competitors go to in order to be the best. They sacrifice time with family and friends, push their bodies beyond their limits, endure pain that would confine me to my bed for its duration, and receive more defeats and bruises than championships and gold medals. I couldn't imagine what would cause someone to make such extreme sacrifices. It seems absurd to me to give up all of that just to do one thing. But then I realized that they do it because they just love their sport, and competing, so much. Most athletes-- especially these ones in the winter games-- don't get significant money from their sport. Many are struggling to make ends meet just like we are. But they do it all-- spend time away from home, race with broken ribs, train for hours and hours-- because they love their sport and want to be the best that they can be. I don't really understand that mentality, because I have yet to find the thing in my life that I would be willing to pour my heart and soul into. But I want to. I want to find that one thing that clicks so much that I want to work harder at it than anything else. I want to be the best, but I can never be the best until I find something worth being the best at. Ugh. This post seems very narcissistic and ridiculous. I should probably post it anyway. I thought I'd show you all some projects I've been working on. These are actually from a while ago, but I don't have any pictures of my more recent creations. These guys are my favorite! Meet Adam and Jamie, named for the stars of the Mythbusters marathon I watched while making them. They make a great team, except for when they are violently arguing or attempting to walk in opposite directions. This is Adam and Jamie's friend, The Captain. He's a veteran of the open seas, and despises anything and everything on land. Including you. I made this camera case a while ago, and sadly I cannot take credit for the design. I found it here. There are new cute camera cases up in her shop now! This is from a project at work, where the kids were supposed to make their own flags. This was mine. I have no idea what to do with it now, haha. So there you go. I'll post pictures of more when I get them uploaded! It's been a while. I tend to forget about this poor little blog for long periods of time, and then I come back and its all neglected and full of weeds and raccoons are living under the porch. My apologies. I feel like things in life have been in a constant upheaval since I graduated in 2007. That's almost three years of what seems like constant change and discomfort, but I find it is actually bothering me less and less as time goes on. I suppose this is good, since in the last year almost everything has changed once again. This time, though, instead of panic simmering beneath the surface, I almost feel a sense of tired resignation. It's like my mind and heart finally realized that change is just going to come, no matter what, and I had better just deal with it or I'll go crazy. That's not to say that I am not excited about some of the change in my life, of course. But change of any sort, good OR bad, is hard on me. I'm happy that I'm finally learning how to deal with it, however slowly. I applied for grad school, was accepted into two schools, completed one quarter, and left the program. I decided to apply for a completely different grad program at a different school. I left a job, started a new one, and am planning to leave it soon to go back to the first job. I started baking our sandwich bread, and am working toward baking all of our bread. Husband and I have tried a lot of new foods: I now eat squash, asparagus, any kind of bean, and Indian food (among other things). We went on our first camping trip (and got rained out!). I've decided to become a vegetarian. We're moving to a different city in a few weeks. I went from working full-time to part-time. So those are just some of the changes I've been dealing with! As you can see, there is a LOT of good in there. Most of it, actually. So I'm focusing on the good, and I'm learning to appreciate the unknowns of life. A year ago, I wouldn't have pictured myself in this particular situation, but I feel like I am headed in a great direction. I feel calm. And for me, calm is the feeling I have sought for a long, long time. What does it sound like to be called by God? When am I "grown up"? What's the difference between following God and following myself? How do I become a better listener? Why do I want to go back to a place with desert, rattlesnakes, wind, and very few trees? Will I be a good dog owner? Will I ever figure anything out? Is it possible to learn to live in confusion? Why does my foot twitch sometimes? Will I ever pay off my student loans? Will I ever have a stable, full-time job? Do I need a stable, full-time job? What do I really need? I mean, really? Why is chocolate milk so great? Why do I do these things to myself? Why are airplanes so loud? Why did we choose to live next to an airport? What will I feel like when this quarter is over? What does God think about all of this? Is God even still listening? I think I am beginning to realize that what I have wanted to do all along is something that I never believed I could actually do. I thought about it, even attempted it once, but ultimately bowed out because there was no way I could fulfill my dreams. There was no way I could be good. This thing resided in the realm of "things I simply cannot do, end of discussion." Really, I'm not sure why this has always been so. But it has. There is a reason that I gravitate toward certain movies and books. Of course I don't expect real life to perfectly mimic what I see and read, but they do contain unmistakable elements of truth. It is that truth that inspires me. I want my own life to embody that truth. What if, even though I am afraid that I will fail, I do it anyway? And what if I actually make it happen? 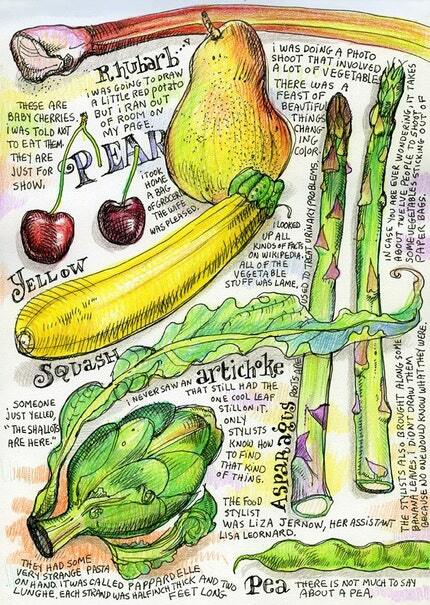 Is it weird that I love a drawing of vegetables? I can totally see it hanging in my kitchen (that is, whenever I get a kitchen with actual wall space). Tommy Kane is so insanely good at what he does. Go check out the rest of his artwork. Incredible. Then there's brainiac, the art of Matt Stephens. I LOVE his illustration style. He is so incredibly imaginative and talented. 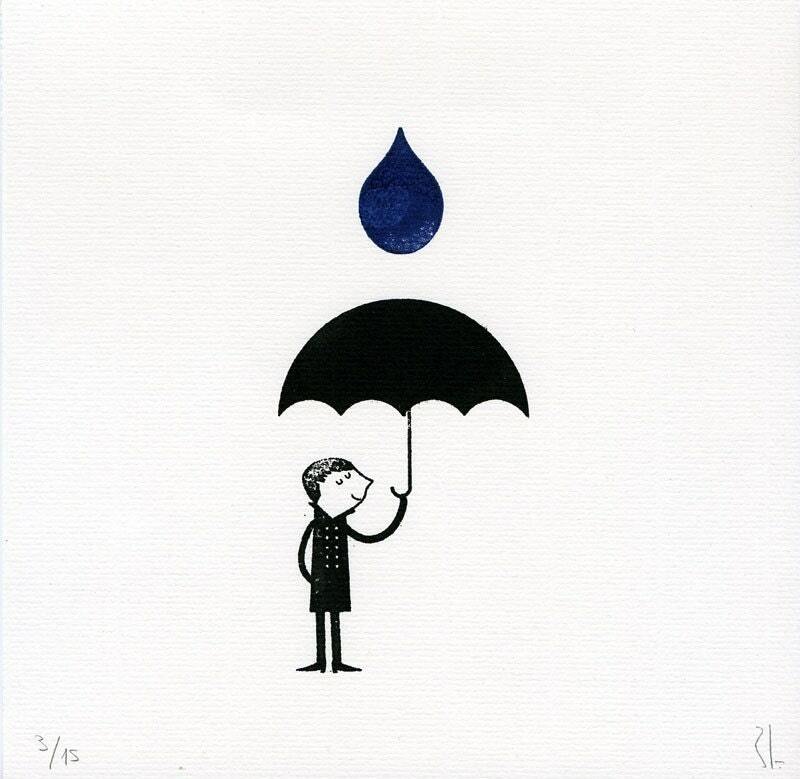 This piece is new to his shop, and I think it is so sweet. 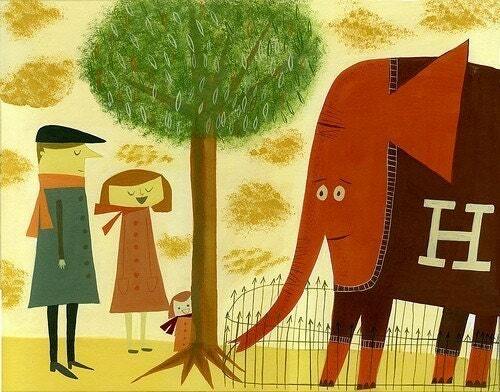 I had to pick this one too, because of its title: "The Abernathy family was happy yet a little surprised that Humbert the rare red sweater wearing elephant was out for viewing." 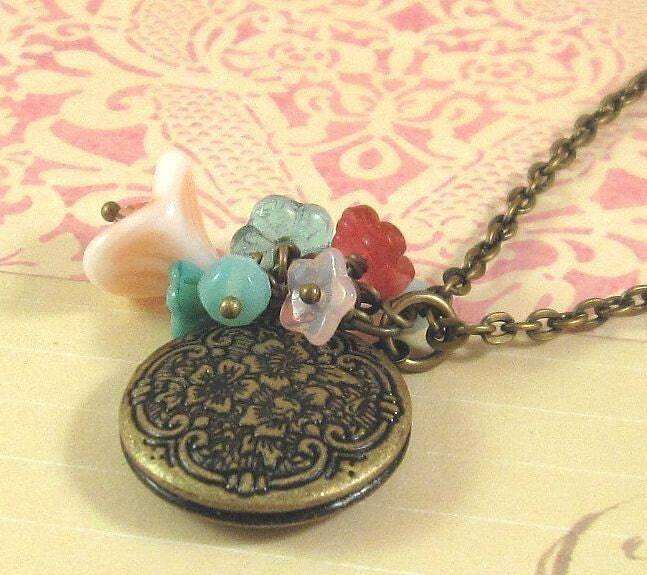 I'm in love with this necklace from MiaBeads. The shop also has some hairpins that I really want! I like her vintage, timeless, but fun style. 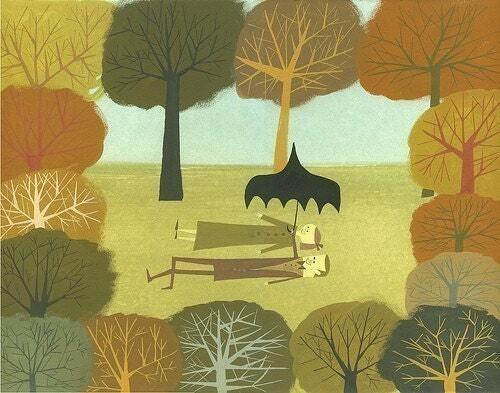 Then there's this gocco print from cosas minimas. We have four of her other prints hanging above our couch, and they make me smile every day. I think her art is one of my all time favorites. Finally, my favorite. I love this print from corid. 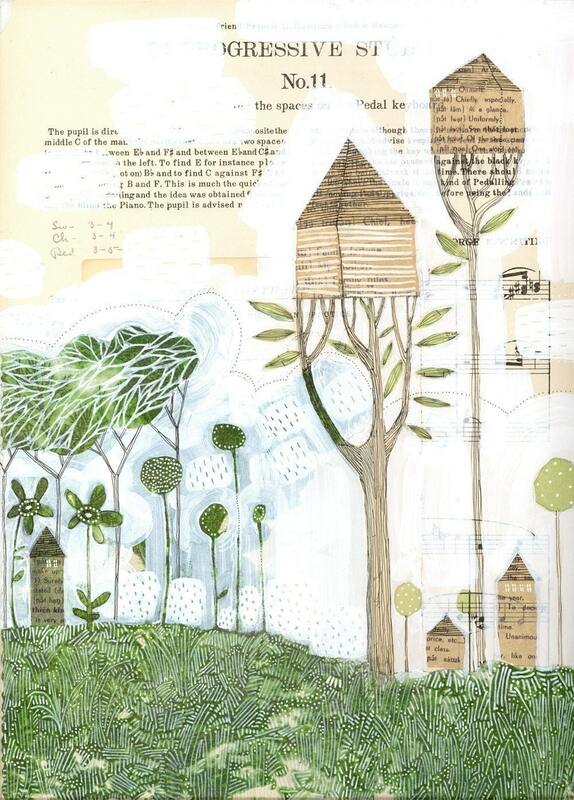 I love the green, and I kinda want to live in one of those treehouses.